AVTR-127B James Cameron directs a scene on the set of AVATAR. 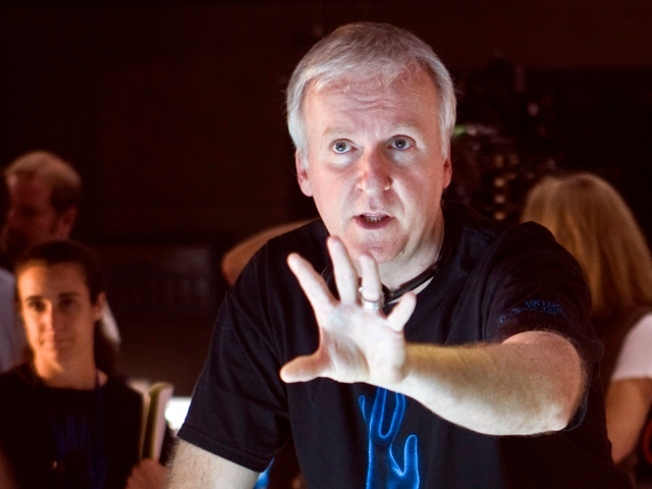 James Cameron isn't batting an eye over the recent Oscar-vote e-mail campaign by a producer of "The Hurt Locker," a move that got that producer, Nicolas Chartier, barred from Sunday's big event. "I really couldn't care less about that," Cameron told Access Hollywood at the 47th annual Publicists Awards in Century City on Friday about Chartier's e-mails, which urged voters to cast their ballot for "The Hurt Locker" and not a "$500 million film," a presumed dig at "Avatar." "It doesn't reflect at all on [director] Kathryn [Bigelow]'s integrity or [screenwriter] Mark Boal's integrity because their producer made a dumb mistake." Cameron, who was formerly married to "Hurt Locker" director Bigelow, has been publicly supportive of his ex-wife's movie, telling Charlie Rose in a prior interview that he hoped she would win Best Director, with "Avatar" taking Best Picture. And on Friday, he seemed to think that she was poised to win – or at least that he wouldn't have to take the stage. "You always have to be apprehensive when you stand up in front of a billion people [that] there's the possibility of making a complete fool of yourself," Cameron said. "The apprehension for me is the possibility of having to do that, but I'm guessing I'm probably not going to have to." The director was honored as "Showman of the Year" at the Publicists Awards (where Access' own Scott "Movie" Mantz was nominated for the Press Award), and Cameron told Access he was accepting the trophy on behalf of his publicity team. "They did such a great job getting the word out. We went into trying to promote 'Avatar' with no brand name awareness – it wasn't based on anything else, it wasn't a sequel and yet, we had to compete at the highest level," Cameron said. "We didn't have Brad Pitt in the film. Our publicity team got us out there, not only here but around the world, and got the movie open."